We have designed our kits to be assembled by modelers of average skill. However, many of our kits contain a number of parts and assembly should be done in the sequences suggested. Each kit comes with detailed, illustrated instructions. Please read the instructions thoroughly before starting assembly. This will help you to understand what must be completed in the sequences given in the instructions. As you go through the assembly steps, remember to check off steps completed in order to avoid missing a step. We suggest a high-liter pen for this purpose. Craftsman Car and Loco Kits: With these kits, plans are usually separate from the text describing assembly steps to aid in referral to them while reading the descriptions of each step. Parts are packaged in small bags, each of which is labeled with a list of parts contained in that bag. These, in addition to our standard parts ID pages in the instructions, should aid in identification. We suggest that as each bag is opened, you staple the parts listing back onto the opened bag in such a way that you can remove parts from it without misplacing the list. Check each package for any missing or damaged parts. We will replace any such parts upon receipt of the enclosed coupon. If you keep all as yet unused parts in their numbered bags, it is easy to locate needed parts. Miniatures Kits: Our Project kits are designed to teach you how to use Grandt Line components–how to cut, glue and “scratch-build” items out of our parts. 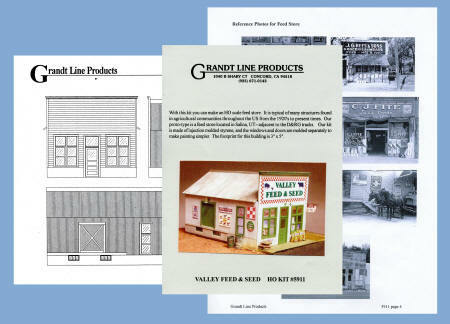 Hopefully, you will become enchanted with the fun of working in 1/4” scale and think up projects of your own. Each project is designed with the idea that you can finish it in a short period of time. All items necessary to complete the projects are included, except tools, paints and glues. Instructions are detailed and easy to follow, and a photograph is included for reference.